MDOT is working on westbound I-96 and closed it through midday Monday. 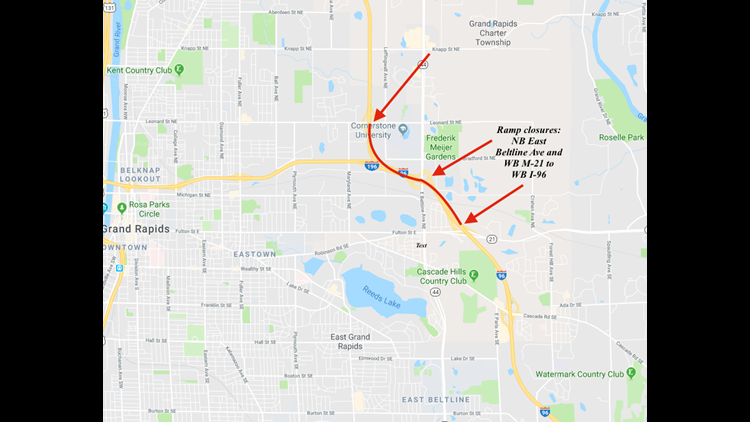 GRAND RAPIDS, Mich. - Commuters on westbound I-96 at the East Beltine had to find a new route through the area for several hours Monday. Westbound I-96 was completely closed at E. Beltline Avenue. It closed at 10:30 a.m. and then reopened around 1 p.m. Monday afternoon. MDOT says the on ramps from Fulton Street and E. Beltline Ave. to westbound I-96 will be closed all day, from 9 a.m. until 3 p.m. The work they're doing is all weather dependent.